Elinchrom studio strobe lighting reviewd by FLAAR Reports. Elinchrom selected as featured studio strobe lighting for FLAAR digital photography. Which strobe lighting for digital photography? Balcar, Broncolor, Dyna-lite, Novatron , Lumedyne, Norman, Speedotron? 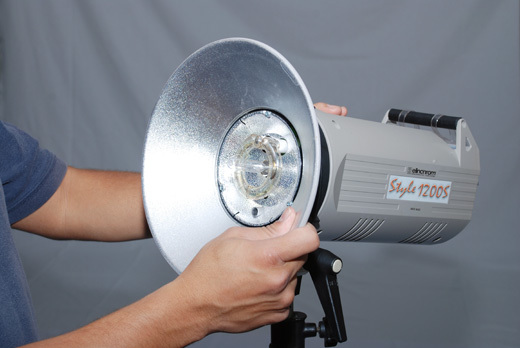 At Photokina, PMA, and PhotoPlus tradeshows we see endless variety of studio strobe lighting. The reason why FLAAR reviews are respected is because we are an actual photo studio. Being at a university makes us all the more independent. We only discuss the equipment we ourselves have found to function ceaselessly. We don't have time for finicky digital photography equipment. 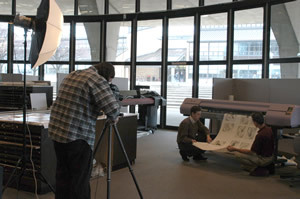 Although tri-linear scanning backs require continuous lighting, single-shot digital backs can use strobe. Multi-shot medium format backs need the highest quality so that each flash is identical for red, blue, green shots. Having lived in Switzerland I prefer European quality. BogenImaging graciously made a complete set of Elinchrom studio lighting available for evaluation so FLAAR is able to feature Elinchrom strobe equipment. The FLAAR lab tests Elinchrom flash equipment for portrait photography, product photography, and interior architectural photography. Eduardo Sacayon and Jaime Leonardo (Staff of FLAAR) evaluated the Elinchrom flash equipment for portrait photograhy and product photography. So we get to learn about speedlights, monolights, digital photographic power packs, heads, flashtubes, digital studio photography lighting. Please return every month to see what is new. Elincrhom strobe light photo studio sample. The Elinchrom strobe lights were only easy to use a nd also to setup and take down. 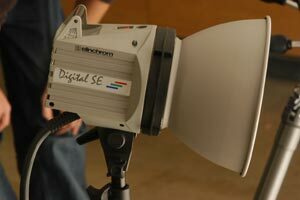 The main light source when shooting with the Mamiya medium format camera were the Elinchrom Style 1200S and the two 600S. The two Elinchrom Digital SE Heads were used to light the background. The main light (1200S) was plugged into the camera while the light meter was plugged into the 1200S. The rest of the lights were set to "slave" mode and would flash simultaneously when the main light flashed. The photographs were taken at a 60th of a second shutter speed and aperture settings of 8 and 11. The color and exposures turned out near perfect. The strobes came off the light stands very easily but held sturdy during the shooting. The Gitzo G1504 tripod was especially sturdy but easily adjusted when needed be. The Gossen Luna Pro F light meter read a similar exposure every time and perform the readings very quickly and accurately. BogenImaging Elinchrom lights being test at FLAAR. The strobes that were tested later with the digital camera were only the two Elinchrom Digital SE Heads connected to the Digital SE Power Supply. The supply was set to “slave” mode and The exposure wasn't as good as using the complete set of lights, but for what was being shot they did a decent job. The Sony DSC-F717 was mounted on the Gitzo tripod as well and was easily adjusted. The Gossen light meter was not used. Setup and teardown for both shootings consisted of less than fifteen minutes with three people. The props and subjects for the photo shoot consisted of ceramic sculptures on white studio display stands. Then we moved on to more animated situations by using a variety of people wearing a colorful sombrero. It was very apparent that everyone that was taking part in the testing of Elinchrom strobes seemed pleasantly surprised with the fun they were having, and the ease of use of the equipment. This first test was in 2002. 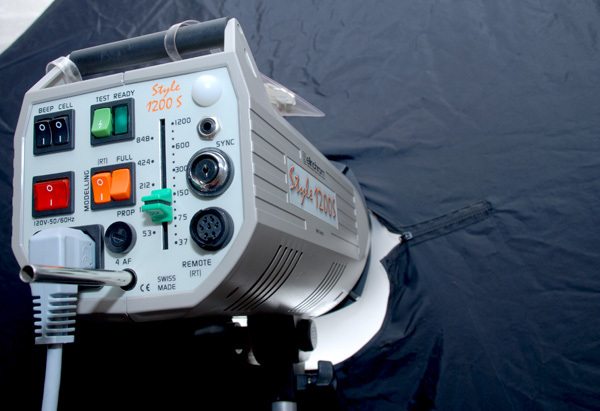 We have been using the Elinchrom studio strobe lighting system ever since. They still work just fine (still in 2009). Additional information on Gitzo tripods, Manfrotto tripod heads, Elinchrom strobes, Metz flash equipment, and BogenImaging light stands is readily available from the distributor (Bogen Photo is now known as Bogen Imaging) at: info@bogenimaging.com or telephone (201) 818-9500. Most recently updated June 4, 2009. Also updated Nov. 25, 2002.